The new 2013 Boss 302 leans heavily on inspiration from the famous 1970 Boss 302, including the iconic hockey stick stripes adorning it's sides. While the 2012 Boss Mustang was ground breaking in it's innovations, the 2013 model focuses on refinement of an already fantastic foundation. As you'd expect, the changes to the 2013 Boss 302 are not ground shaking. However, the overall first impression of the new model are one of substance and a more muscular feel overall. 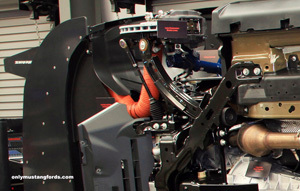 The areas that jump out at you on the new 2013 Mustang Boss start with the new vented hood louvers combined with removable grille caps where you'd find fog lights on the 2013 Mustang GT. These two new additions allow you to draw more air under hood and vent it, getting cool air to important areas, such as the front brakes and under hood. The front fascia has been modified and is again more muscular looking, with it's more squared off lines and re-designed front splitter/spoiler. And of course, the addition of the 1970 style reflective hockey stick and Boss 302 logo added to the sides, hood stripe and rear light panel blackout take you back to the look of the second year for this iconic pony car. While nostalgic touches take you back to the pony car's beginnings, the new 2013 Boss 302 tech specifications and additions do not. Bringing this Ford Mustang to the present and improving for the future are new HID headlights for better on the road visual performance and bright led surrounded tail lights, replacing the standard units from the previous year. A black rear spoiler completes the look at the rear, thankfully not including the high mounted stop light. My only real issue with the exterior styling is the same as I had for the 2012 Boss and that's in and around the wheel wells. It just doesn't have the same visual impact that you get from the front or rear. You can't say that for the 1970 Boss 302 even though it was the same as the standard sportsroof (fastback) cars. I'd like to see some new wheel well flares and maybe even an updated version of the still very cool Magnum 500's from the 70's. 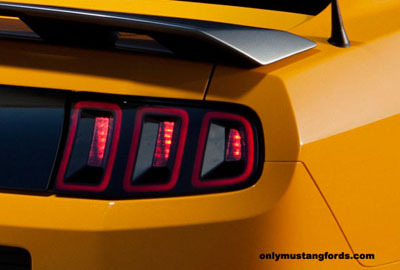 Grabber Blue is back and the new, big and bold School Bus Yellow for the 2013 Boss 302 should please many 1970 Boss fans as well as the return of a blacked out tail light panel. And the cool looking lime green number pictured above is painted in "Gotta Have It Green" just screams Look At Me! 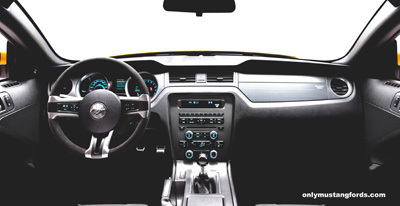 Additions to the 2013 Boss 302 interior are in some ways muted, and others outstanding. In the muted department, the 2013 Boss Laguna Seca version shies away from it's in your face brightly painted rear seat area cross brace, replacing it with a more muted dark argent replacement. The wow factor lies directly in front of you when you turn the key. Is that a little drag racing Christmas tree display I see? Ford has added some very cool additions to the Boss for the race aficionado and this time includes the drag racing fans. Of course this new feature is for "track use only" it may be hard pressed to keep it there. What is this feature? Pressing the countdown start button activates the lighted Xmas tree from pre-staged, to staged. Green means go, but just like the drag strip, if you're too quick on the trigger, you'll red light. 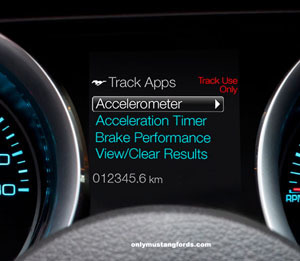 Now... the fact that you have your own drag race app is cool all by itself, but your new 2013 Boss Mustang was busy working in the background gathering up a bunch of useful information for you to enjoy. Hey! Look at that ! I broke 11 seconds in the quarter mile, but my 0-60 is a bit off from the last time. No. I'm not kidding. You can actually do this. That's almost worth the price of admission alone. 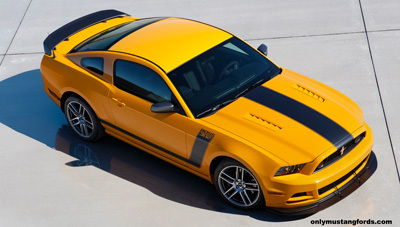 If you've been waiting for the 2013 Boss 302 specs, don't worry, they're here. 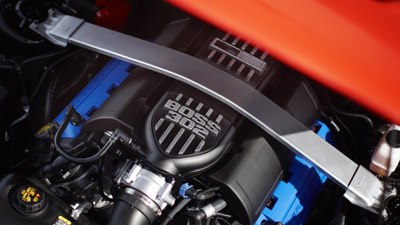 The now famous 5.0 Coyote engine features prominently in the new 2012 Boss 302 specifications, with a solid 444 horsepower and 380 lbs of torque coupled to a silky smooth close ratio six speed transmission and a 3.76:1 final drive. In real world, seat of the pants terms, this is car is a rocket! With mid twelve second times in the quarter mile and a 0-60 near 4.5 seconds, this thing goes. In the old days, a car capable of these kinds of numbers would be a high compression, lumpy running, low rpm nightmare, suitable only for the track. But this is a car you can drive your dear old grandmother in comfort, to the hair salon, then drive directly to the track and race all weekend. Continuing on the race bred handling and steering prowess of the 2012 Mustang Boss, the 2013 model further refines the experience. Ford Focused on reworking the spring rates all around, adding a larger rear stabilizer bar and replacing bushings with stiffer units, making an even tighter, better handling experience. Like the Shelby models, Ford engineer specified ultra high performance Brembo brakes all around, outfitting the fronts with big 14" vented rotors and 4 piston calipers, coupled with specially formulated friction materials. Getting all that horsepower to the ground and keeping unsprung weight low, necessitated special 19 inch low weight alloys coupled with 245/40/zr90 Pirelli P Zero tires on 9 inch rims at the front and larger 285/35/zr19 skins mounted on 9.5" rims at the back. Coupled with that very cool new Racing Drag Strip Christmas tree and other accelerometer treats, you'll be able to monitor braking performance which could be a boon on the track. But, if your interests lie more with in car technological features, you'll appreciate the fact that the standard equipment list includes Ford's fabulous SYNC system, which provides features you'd normally only expect to see on a high-end Mercedes, like integrated voice activated controls including bluetooth connected cell phone, mp3/ipod and integrated emergency call functions to name just a few. 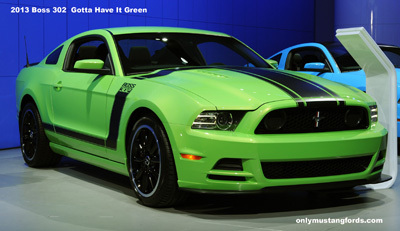 The new 2013 Boss 302 order guide should appear in January 2012, with production scheduled to begin sometime in March 2012.